Yes, it is me in my finest aggressive biker stance. Intimidating, huh? 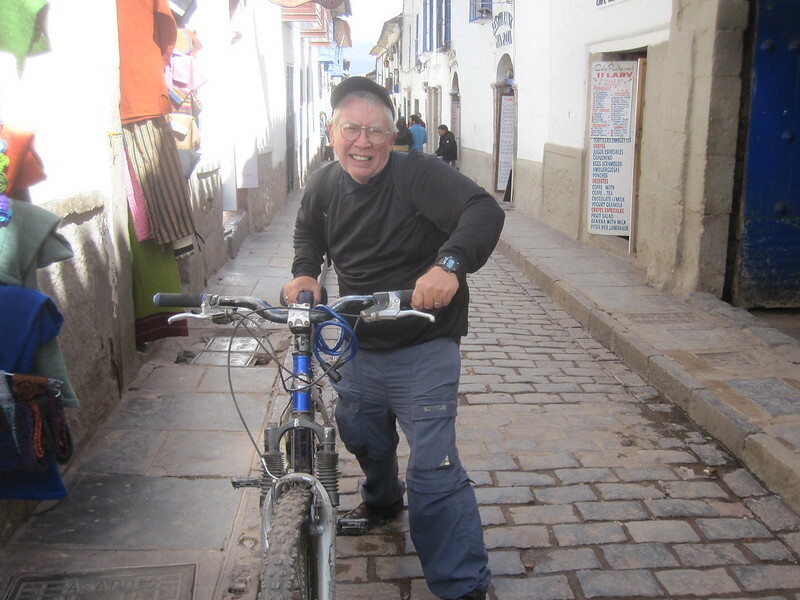 What I did was to rent a bicycle in Cusco for one day ($10) and go for a spin. Luckily for me it was a 24 speed and the gears shifted reasonably well because Cusco is very hilly. Unluckily for me, Cusco drivers are some of the most discourteous drivers I have ever seen. They almost dare pedestrians to walk out in front of them. They don’t slow down and they seem to have a real affection for the sound that their horn makes. I’ve seen some bad drivers in my day, but I think that South American males have taken their machismo behind the wheel of their vehicles in a very unhealthy manner. Also, you might want to think twice about renting a bicycle in hilly terrain at altitudes above 11,000 feet if you are older than 60 years of age. I;m not sure I’d recommend it to anyone who isn’t in the very best of health. 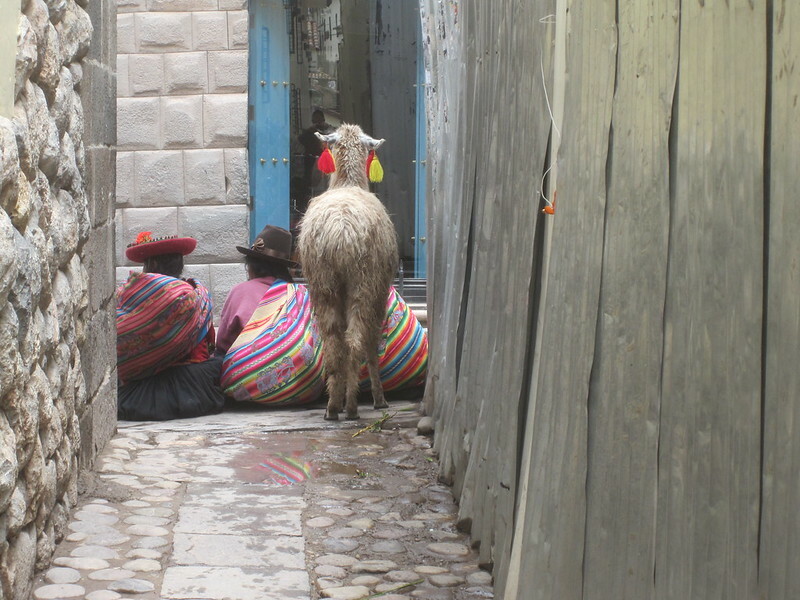 This entry was posted in Travel and tagged Cusco, Peru on May 20, 2012 by Steve. 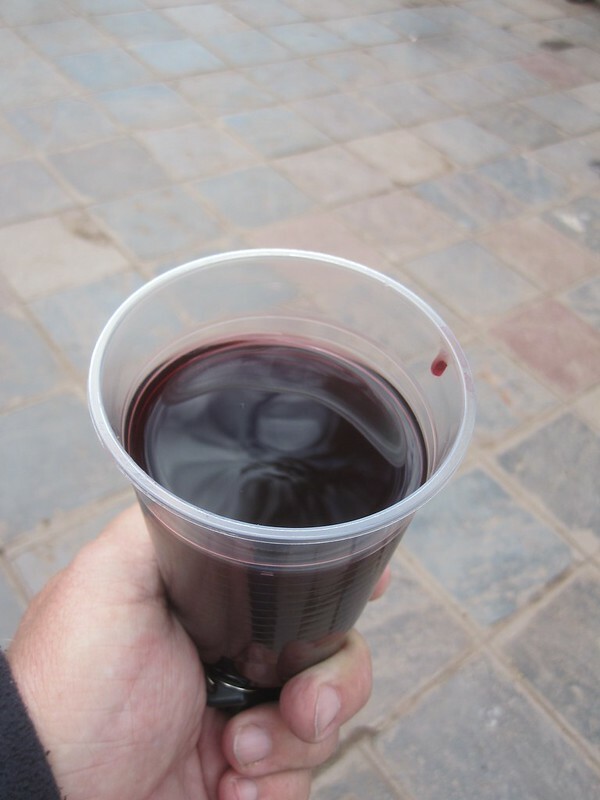 It’s called chicha morada and it’s made from corn of the same color. Actually, I was amazed to find corn in dozens of different colors. Apparently, the Incas took the growing of corn to new heights. This drink was available everywhere. I only tried one glass. They sell the stuff on the street and I wasn’t really sure about the purity. This glass I bought at the local culinary school lunch sale they have during the weekday lunch hour. It was okay. It tasted like weak grape juice. This is the non-alcoholic version. There is also a version that gives a slight buzz. I went to the Coca Museum. Coca is a big deal in Peru. It is legal to buy and they sell it in lots of locations. I went to the market and saw it available by the pound. They sell it at all the tourist sites and I bought a small bag for $1. I tried it. It gave me some energy and made my mouth a little numb. At the hostels and restaurants they serve coca tea. It’s really good. Coca is a national product in Peru. There are many products that are mode from coca. One, of course, is cocaine. This is where the problems with coca cultivation start to take on a whole new meaning. 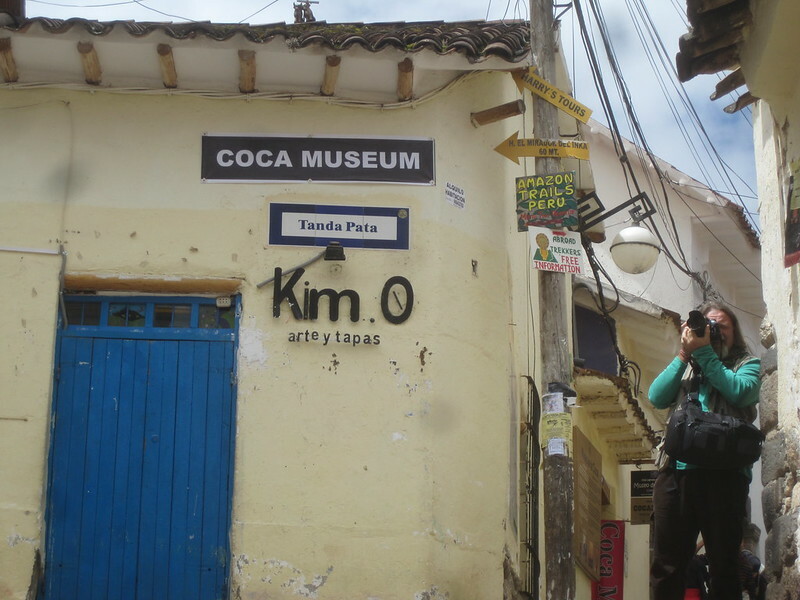 Note that the vast majority of coca users in Peru have absolutely nothing to do with cocaine. They use the coca leaf in the same way it has been used for thousands of years. The politics of the coca leaf are … interesting. 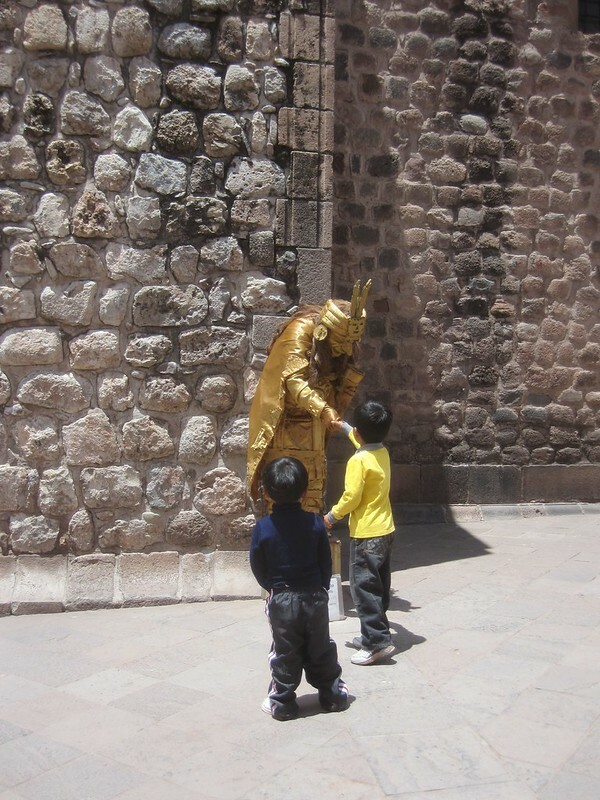 This entry was posted in Travel and tagged Cusco, Museum, Peru on May 20, 2012 by Steve. There I was, minding my own business, having a cup of great coffee and a small serving of flan. I was working on my blog. I had found this little cafe that served really good coffee and pastries and it was quiet and didn’t cost too much. I had been going there because the place where I was staying served some great tea but some really bad coffee and the breakfast was, at best, poor. I have found that there is no “ultimate accommodation” and, at the price I was paying, $11.70 a day, I couldn’t expect too much. So I’d slip away for coffee and pastries or I’d pick up a breakfast tamale on the way to the coffee shop. So what is this picture all about? It’s about gigglers, which is what I call younger people who giggle a lot and these girls qualified. First they asked me if I could take a picture of them. I said sure, not knowing that every one of them had a camera and each one of them wanted three or four poses. In the end I must have taken twenty or thirty pictures. What a nice guy. But, that doesn’t mean that I appreciated them. One thing I’ve learned about getting older is that I appreciate loud and obnoxious gigglers less and less. I’m just g;ad I wasn’t like that when I was their age. Or was I? It was called chicken stew. 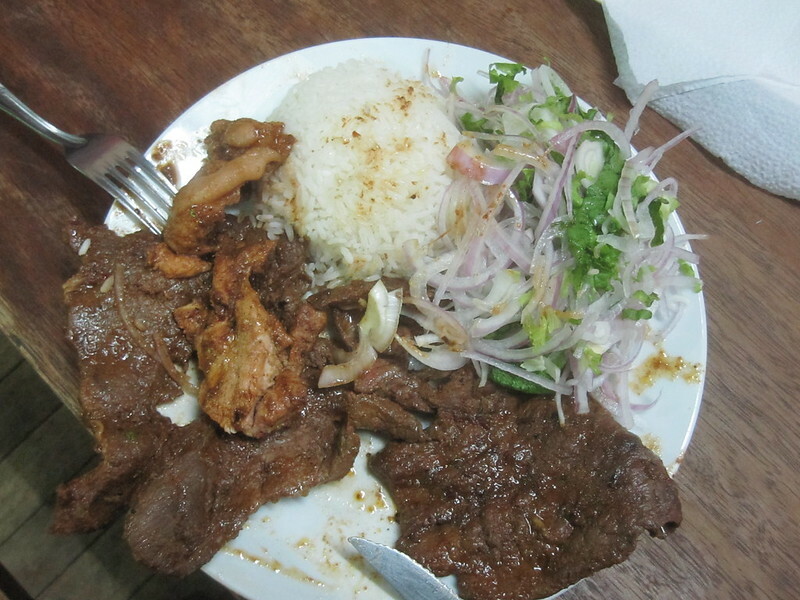 I went with one of the locals I met who I asked out to lunch to help me get a better handle on food in Cusco. We went to this great little restaurant where I had this fabulous lunch for $3. This plate was just the main dish. In addition I had an appetizer, a soup and a drink. There was way more than I could eat. 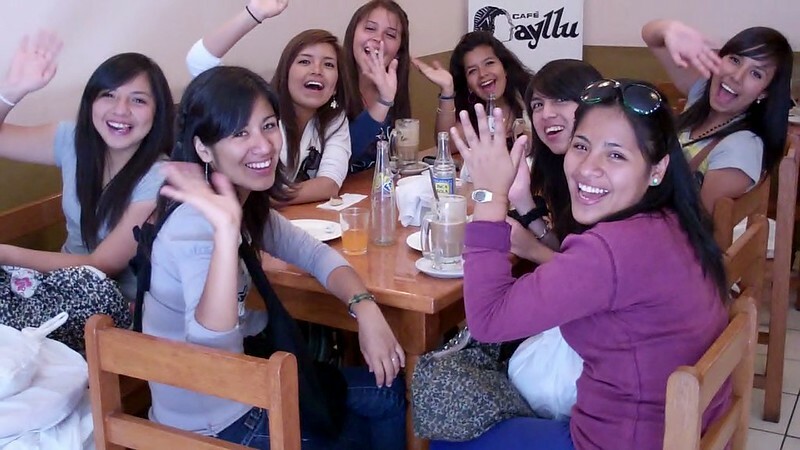 One thing I’ve learned over the years is to go to lunch or dinner with locals. They know a lot more about where to go and what to eat than any guide book author. That’s not to say that guidebooks should be ignored. It’s just that locals are so much better versed in what’s going on at the local eateries. 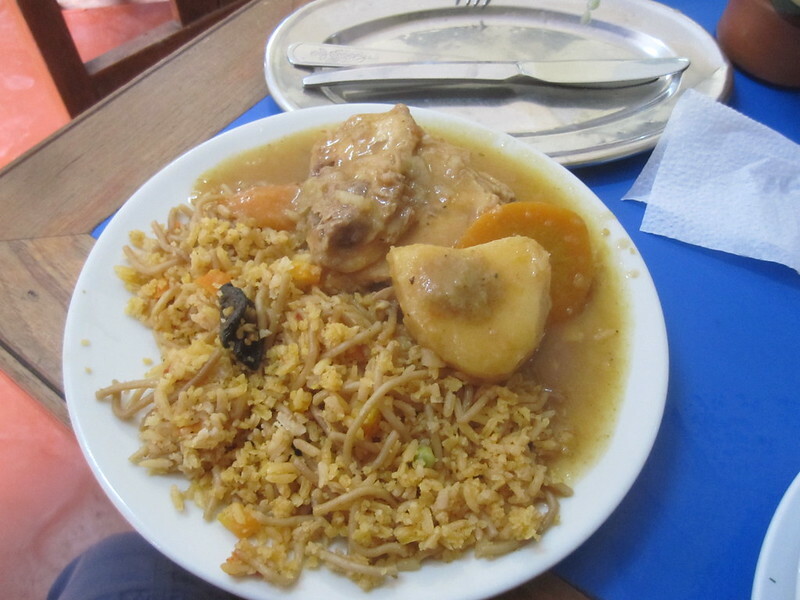 This entry was posted in Travel and tagged Cusco, Lunch, Peru on May 20, 2012 by Steve. When I went on the tour to Moray and Salinas I met another American and we went to La Chomba, a restaurant recommended by the tour guide, for dinner. I had the carne or beef. It was okay. It was a little tough but the seasoning on it was excellent. La Chomba is a real traditional Peruvian restaurant. We were the only gringos in the place. La Chomba was about as local as it gets. There was no way I was eating the salad. But, the very best thing was I got to have a bottle of Cusqueña, a dark lager beer that was exceptionally tasty. These are the salt pans of Salinas. Salinas is a village near Cusco. The salt pans are owned by the people of Salinas. 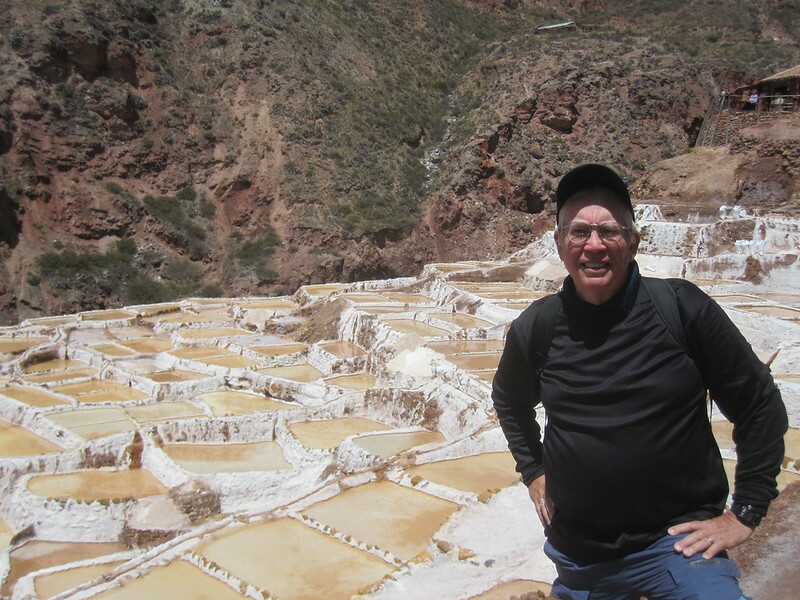 Apparently, people have been walking the salt deposits of this area for centuries, even long before the arrival of the Incas. Working the salt pans is the business of the village although I was told that each pan belongs to a family of the village and it is passed down from generation to generation and that a person must be a member of the village to own one. Anyway, I’d never been to a salt production facility quite like this one. All the ones I had been to in the past produced salt from sea water. This was my first experience with salt production from salt pans. He (I assume he was a he) was a good mime. He did his job well. A person could place some money in the mime’s box and the mime would slowly reach into his pocket and pull out a piece of paper and hand it to the person who placed the money in his box.. He was pretty good. Not the best I’ve ever seen That title goes to someone in Barcelona who took in money at a disarming rate. He was good. This mije, however, was making a living. The children loved him. I gave several of them a coin so that they could participate in the ritual. He kept trying to give me the paper from his pocket, but I wasn’t the one who kept putting money in his box. It’s me. I went on a tour. The tour went to Moray. 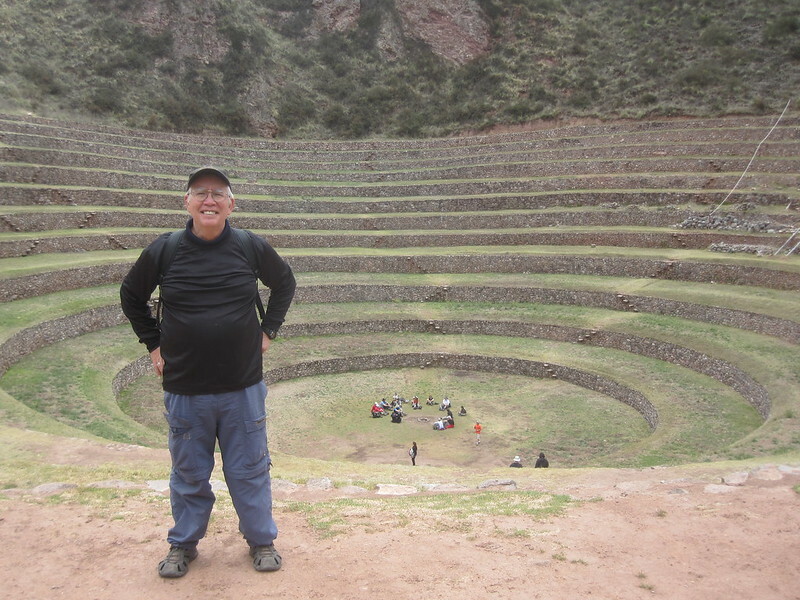 Moray is in the Sacred Valley. Moray is a valley or terraces much like the ones you see behind me. Note this place is big and there are lots of posters of the site that can be seen all over Peru. It seems, or is hypothesized that the Incas used Moray as an agricultural laboratory to test different types of plants for agricultural production. Anyway, after having seen dozens of pictures of the place, I had to go and see it for myself. Every tourist agent in Cusco sells the six hour tour to Moray and Salinas for about $15. It was worth it. These two places are very interesting.